Zarda Pulao or Meethe Chawal is a sweet rice preparation, deliciously infused with cardamom and saffron. A family favourite, this recipe is a great dessert and is quite easy to make as well. Here is how to make Zarda or sweet pulao in a traditional North Indian style. We usually like eating savoury, unique rice-based dishes such as Spinach Rice, Thai Pineapple Fried Rice, Ellu Sadam etc. And they all definitely taste yummy but what if I tell you that you can make sweet rice which can be eaten as a dessert or as an accompaniment with your meals, would you believe me? Meethe Chawal or Zarda Pulao is a sweet rice preparation. 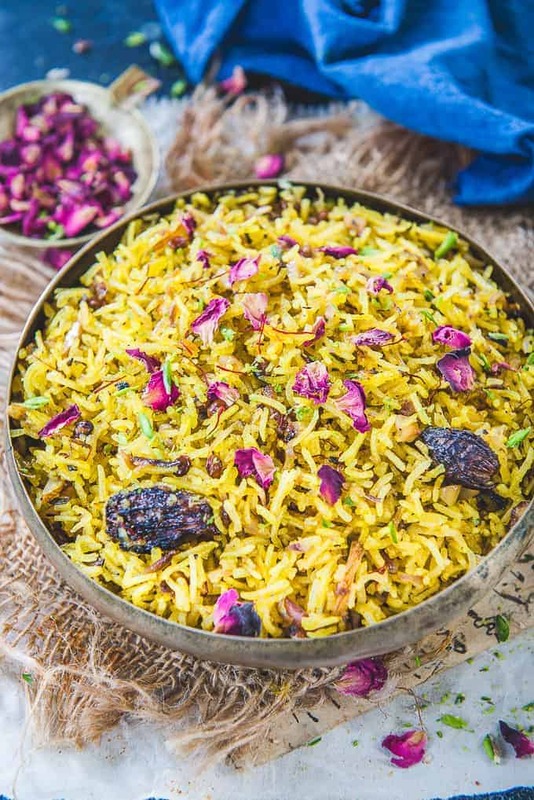 My mom has been making this sweet pulao recipe, year after year since my childhood for Diwali. 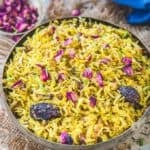 Laden with ghee and dry fruits and full of flavors from saffron and rose water, this Sweet Rice or Zarda is one of my favorites dishes. This delicious cardamom and saffron flavored sweet rice provides a wonderful end to any meal. It is also easy to cook and loved by both children and adults alike. Meethe Chawal can be served as a dessert or you could feast upon it even during brunch or dinner. It actaully goes well any spicy non veg curry like Bhuna Gosht or Indian Mutton Curry. Here is the easy and simple recipe to make this delicious zarda pulao. Do give it a try. BTW, for more such interesting recipe, do not forget to follow me on Facebook, Twitter, Instagram, and Pinterest. Hurry! Zarda is a sweet rice preparation were rice is cooked with sugar, saffron and dry fruits. It is made especially for festivals and wedding and is served as dessert. The work came came from the Persian work Zard, which means yellow. Because this dish is yellow in colour, it was called Zarda Pulao. 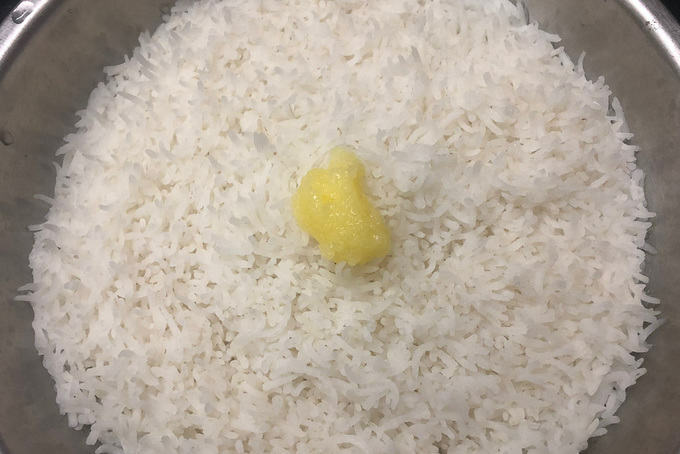 The rice doesn’t cook once sugar is added to it. So make sure the rice is cooked properly before adding sugar to it. But also make sure to not overcook the rice. It will result into a mushy Zarda Pulao. Muslim style Zarda has some khoya added to it too. It makes it even more richer. You can try making this variation by adding 1/2 cup crumbled khoya. Add it just after mixing the rice with the milk mixture in the pan. Just sprinkle it on top of the rice and then cover the pan. Some people also add green and red food colour to their sweet pulao. However, I like it yellow and stick to using saffron and yellow food colour only. You can also skip adding the yellow food color to Zarda and only stick to Saffron. 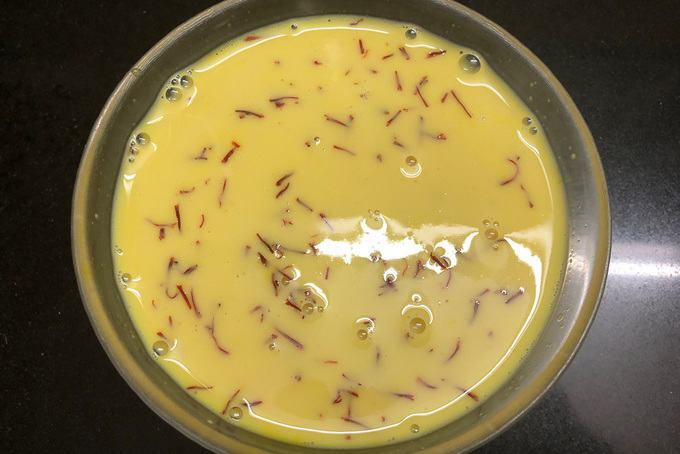 In this case, soak the saffron over night in milk to get the bright yellow colour. I have read that some people also add orange zest to their sweet pulao. You can try it too. Add 1 tsp orange zest along with the milk. The base of zarda is rice. Use long grain aged basmati rice to make it. Since this meethe chawal are made for special occasion, make sure to use the best variety for best result. To give this pulao a rich yellow colour, a pinch of yellow food colour is added to it. You can skip adding it if you wish to. Adding too much saffron will make the rice bitter, so don’t use it in excess. You will need some milk, sugar and rose water to soak the saffron and food colour. Ghee is needed to give a tempering to the rice. Don’t use any other oil in this recipe. 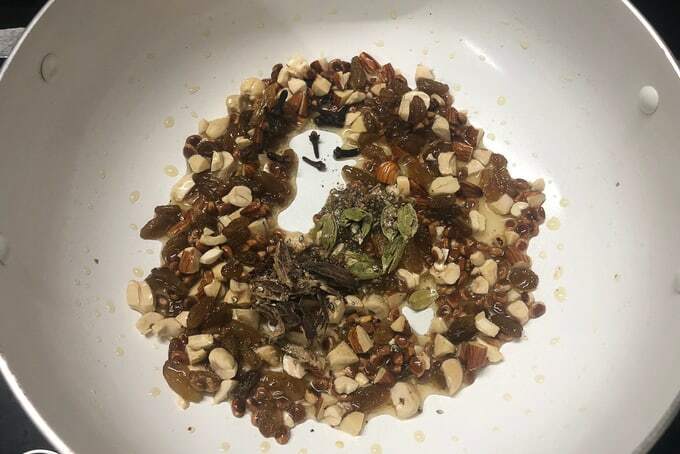 You will also need some whole spices like cardamom, black cardamom and cloves and dry fruits like almonds, cashew nuts, chironji etc. Chironji is traditionally added in zarda so try to not skip it but there are no rules about it. If you wish, you can add a tsp of orange zest to the pulao. Some people add it and some don’t. There is no rule about it too. We don’t top the zarda with khoya, but it gives a even more rich taste to it. If using, top the rice once you add it in the pan with crumbled khoya and then put the lid of the pan. 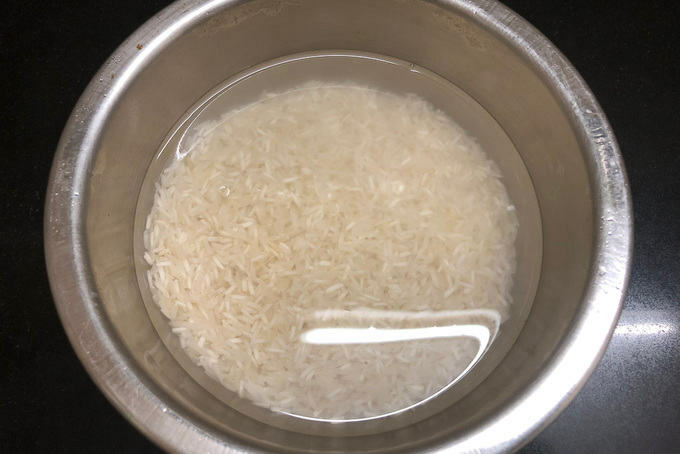 Gently wash the rice and soak in water for 1 hour. Strain and keep aside. Mix milk, yellow food color, saffron, rose water and sugar in a bowl. 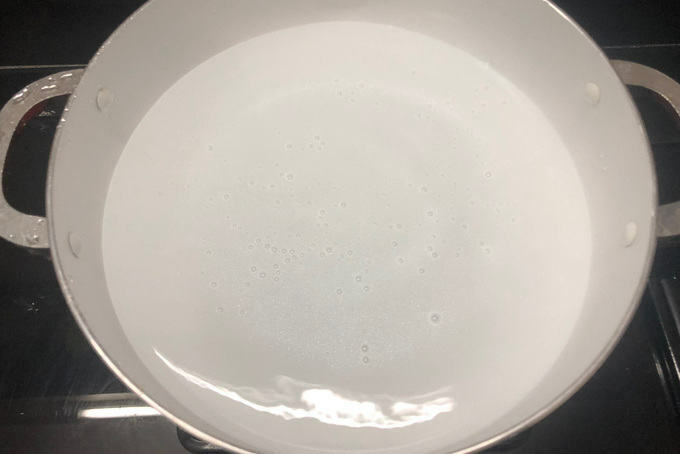 Heat 4-5 cups water in a pan. When it comes to a boil, add the soaked rice. Cook till the rice is done. Strain in a sieve and mix a tsp of ghee in the rice and keep aside. 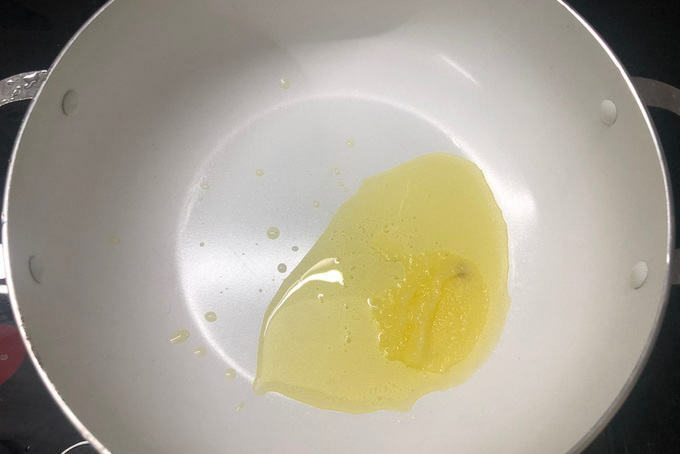 Heat the remaining ghee in a pan. 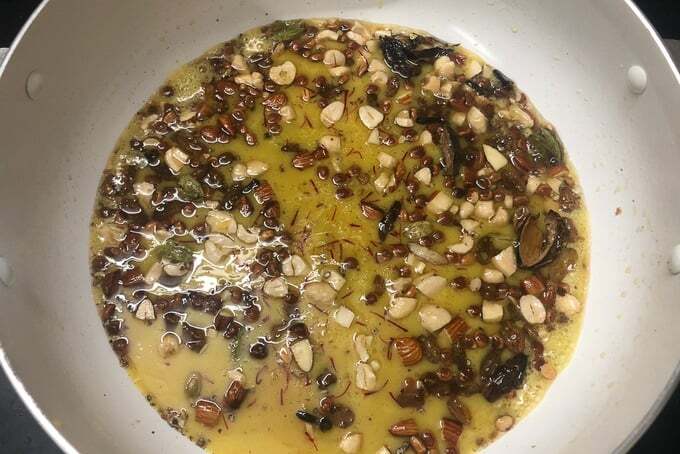 Add almonds, cashew nuts, chironji and raisins and fry till golden brown. Add cardamom, black cardamom and cloves and fry for a few seconds. Now add the milk mixture in the pan and bring it to a boil. Simmer the heat and add the rice and mix gently. If you are using khoya, you can crumble it over rice at this stage. Cover and cook on low heat for 10-12 minutes. 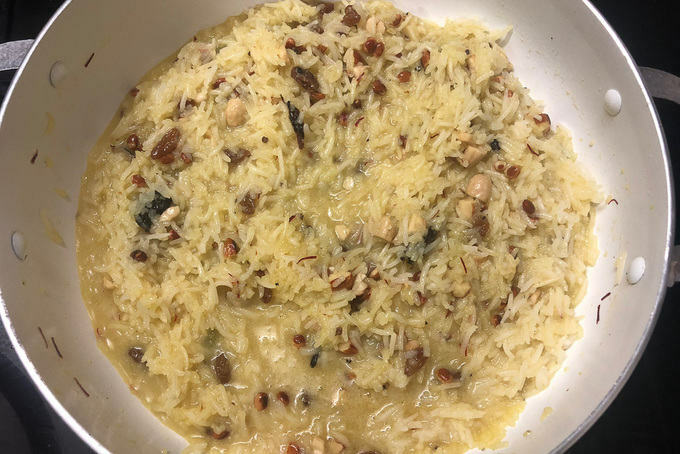 Zarda Pulao or Meethe Chawal is a sweet rice preparation, deliciously infused with cardamom and saffron, a family favorite. 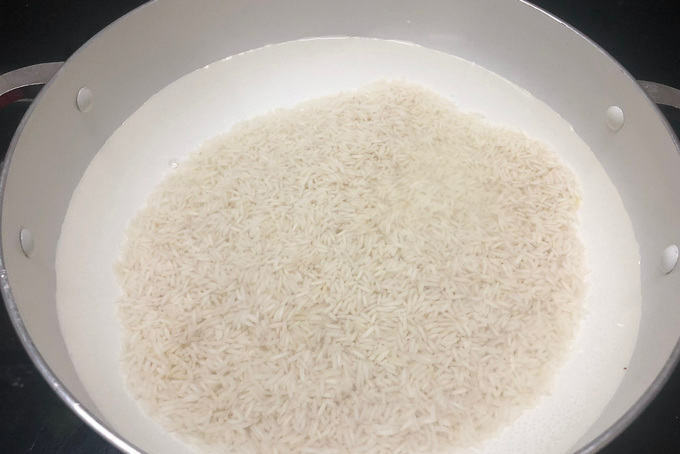 Gently wash the rice and soak in water for 1 hour. Cook till the rice is done. Strain in a sieve and mix a tsp of ghee in the rice and keep aside. Add almonds, cashew nuts, chironji and raisins and fry till golden brown. Add cardamom, black cardamom and cloves and fry for a few seconds. Simmer the heat and add the rice and mix gently. Cover and cook on low heat for 10-12 minutes. Fluff the rice with a fork and serve hot. Oh my goodness I love all your recipes. Thank you for taking the time to create this community of great recipes. My request is can you make a few low carb recipes… Something ketogenic friendly. Sending you blessings for the holidays.